LTO Flash! Update: Firmware, jzintv, bug fixes and more! Many, many updates. Title lists the primary ones. It's shocking that it's been three years since the last official update already. In reality a lot of code has been written in that time. If you are purchase Ninja Odyssey or other LTO Flash-specific ROMs, I recommend you get this update. During testing, a bug in the UI was found that is fixed in this release. As always, make a backup of your "Documents/LTO Flash" directory just in case. Consider this an open beta. Mac version is still 32-bit. Windows: Remember to "Unblock" the .zip file after you download it, and before you "unzip" it. If you really want, I can post details of changes. The gory details are automatically exposed when the version becomes "Current". I haven't invested a great deal of time on creating a way for INTV Funhouse to have "Stable" "Beta" and "OMG WTF" channels for the software. This time out, I mean to make this the "official" release in the next few days unless you users out there run into serious trouble. Do we need to reinstall the FTDI drivers that come with the package? -- Update copyright year on title screen to 2019. -- Fix word wrapping bug for long names with no spaces. -- Update copyright year on title screen to 2018. -- Config bit 54 disables config menu on cart (WIP). -- Fix rare crashes on homebrew games with stack in RAM. Firmware 3994 was never released widely, but a few folks had it. 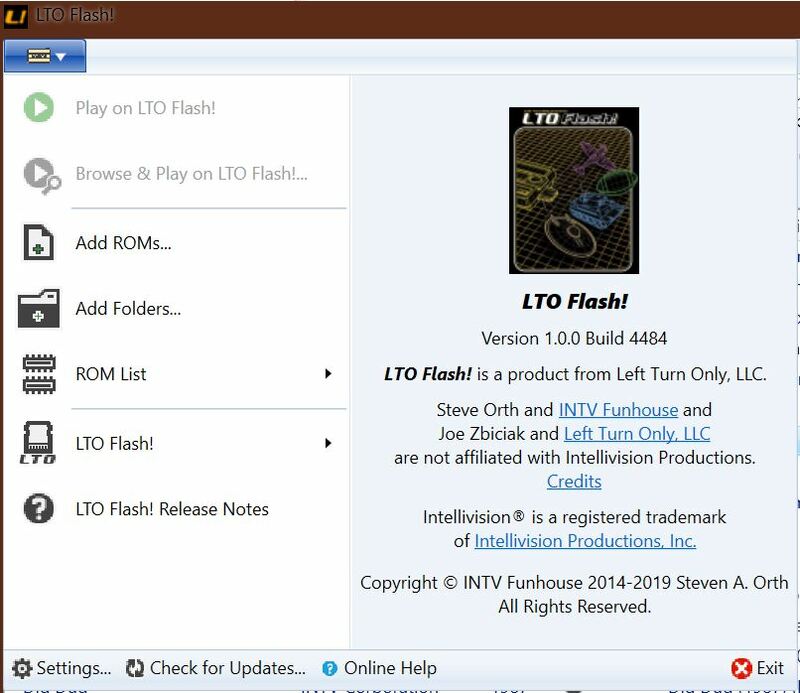 As far as I know, LTO Flash! still doesn't work on the Keyboard Component, but we're working on it. I have a tester lined up, as I don't have room in my tiny apartment to set mine up reasonably. I will say it's closer to working on the KC than ever before, for all 3 or 4 of us that care. Thanks for the update! Any thoughts of releasing a PlayCable "skin" for this in the future? I haven't applied this update yet, but I just noticed that I'm not able to add any new roms to the LTO! ? In fact the Search for Roms option in the menu is grayed out? I am running as admin so....not sure what that is about. It has been since the Intelly homebrew contest over the summer since I've tried to add any new roms to my LTO!. Also, unless I'm missed it? Where is the firmware update? It isn't present in the installer and I'm still on version 23xx according to LTO! Flash. Edited by -^Cro§Bow^-, Sun Feb 24, 2019 10:39 AM. I'm using the Mac version of the UI. I ran the .dmg installer and it worked fine. However, I can't find the firmware update to install to the cart in the Documents folder or anywhere else. 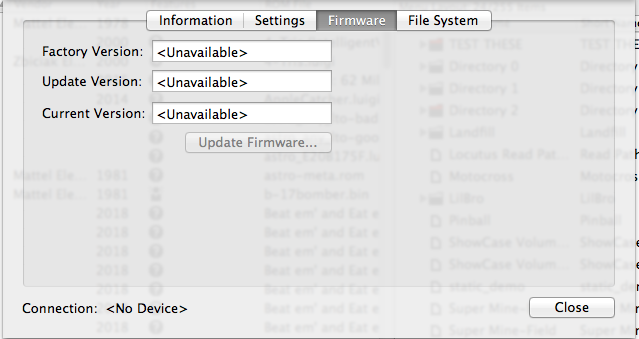 Where should I look to get the firmware update that goes along with the updated UI? Have you connected your LTO Flash! cartridge to the computer? When you do, you should be prompted to update the firmware on the cartridge. In fact the Search for Roms option in the menu is grayed out? I am running as admin so....not sure what that is about. If you check in the preferences, do you see any directories listed in the "places to search for ROMs" list? If there aren't any directories listed, then you can't search. The firmware update is included in the new version of the UI. When you connect the cart, you will be prompted to update. I'll talk to @intvnut about making the firmware as a separate download. I have. Just disconnected and reconnected to verify. I show in the "About" screen that the UI is up to date with build 4484. It just never asked about updating the firmware and I can't find it anywhere to force the update through the menu system. Yeap...same here it never prompted to update the LTO! Flash though it does see it just fine. And no there aren't any directories in my search list nor is there a way to add any? No right click function or anything I could find to add directories to this? Edited by -^Cro§Bow^-, Sun Feb 24, 2019 11:10 AM. Could you clarify 'disconnected and reconnected'? 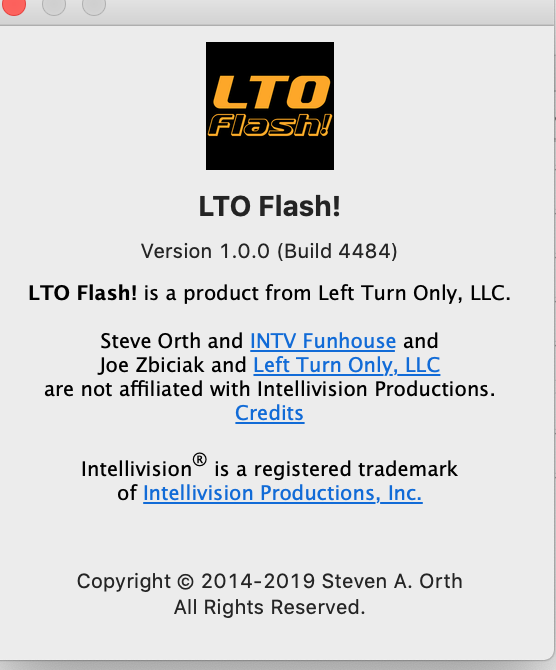 Have you connected your LTO Flash! cartridge to the USB port on your Mac while running the UI software? When the cartridge is connected, you can go to the 'Device Information' page and see the current firmware and install the update if it doesn't automatically prompt. Note that I took these screen shots when I did not have my cartridge connected. On mine it shows connected since I've customed named it and that appears properly. But mine still shows as having the factory firmware of 2386 on it and on that page detailing that the Update Version says Unavailable. 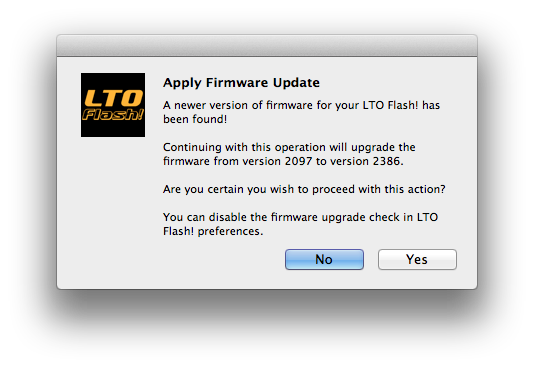 I believe it always has hence why I've never updated the FW on my LTO! until I noticed it mentioned in your updated UI post. I think the build has the new release notes for the firmware, but not the binary. That's what happens when you test with your test cart that has the latest firmware on it. I'll be updating later. Pressing domestic matter. On Win 10 and having the same issue. 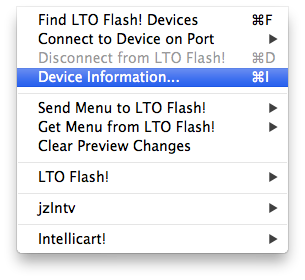 App drop down shows version 1.0.0 build 4484, but LTO Flash! tab shows factory and current version to be 2893 and update version to be unavailable. No 4484 .upg can be found. Edited by mattyv316, Sun Feb 24, 2019 11:26 AM. OK. Unzip this and browse to the file using the manual update firmware option. I'll be releasing an updated installer later today. The manual update worked great. Thanks for posting! OK. I found the bug, and a simple workaround. LUI *is* shipping the correct FW update. There's a bug in the code where it checks to see if it needs to extract the firmware file out to disk. The UI will not replace those files with the ones that it ships as internal resources. So the new version isn't copied to your system. Next time you start the UI and connect your cart, those files will reappear -- but they'll be the new ones. I'll be working on a fix for this, but it'll take a little longer than just rebuilding the installer... Turns out it had the right firmware after all. Looking on my dev system, it appears that I was exploring a solution to this at some point, but never finished it. Firmware updates have been so rare since release that this is only lightly tested code. During the hardware beta we were usually *manually* upgrading, downgrading, and re-initializing firmware, so those pathways got a lot more attention. Do I have to take my LTO out of the sealed package for this update to get done?